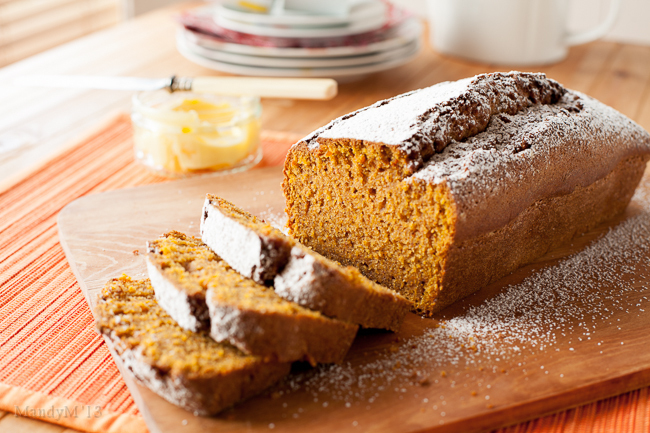 Spiced Pumpkin Bread — What the Fruitcake?! 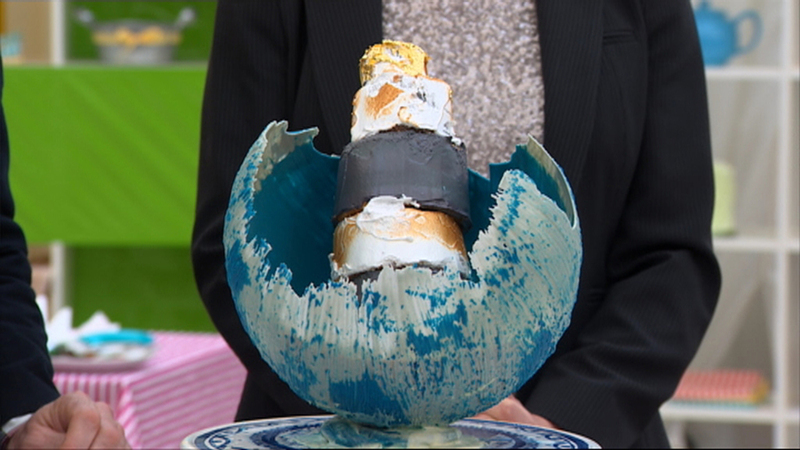 And here it is, the Great Irish Bake Off final. I can't believe it's been eight weeks already! To be completely clichéd, time really does fly when you're having fun! Although, I'm not sure what that makes me, if I'm having fun while others are stressed out of their minds and baking their asses off in a hot tent... A typical viewer, I guess! The recipe I have for you this week has absolutely nothing to do with this week's episode, not in the slightest... But, it was something that I made during the Bake Off, and in fact, was very nearly posted during bread week. But, it is seasonal and great for this time of the year. There's nothing particularly special about the recipe, except that I've gone to the trouble of working out how to make it without tinned pumpkin, as that's something that you don't find in our part of the world unless you're happy to pay through your nose for a precious tin at a specialty store. And seeing as this loaf is so delicious, you'll want to be able to make this often and without the unnecessary expense. So there, I've performed a good deed by posting this recipe which I found over at My Baking Addiction. What I've also done is halved her recipe so that you can choose to make one loaf at a time, as the original recipe is meant to make two loaves from one tin of pumpkin, but because we've gone rogue and decided to make our own purée (which is as easy as pumpkin pie), we can choose to make one, two, three... five! loaves at a time, should we choose to. Crazy, I know. But I like living on the baking edge like this. So, about that purée. I don't know what the rest of Europe is like, but here in Ireland pumpkins only come out around Halloween. Now, I could go to the trouble of finding various pumpkins outside of that time period, but this recipe is about ease and convenience, so I've gone with something that's easy to find. Butternut. I know, it's technically a squash, but it's plenty pumpkinny enough in flavour. If you can find other pumpkins, go for it, but butternut will do just fine. Take 1 x butternut, cut in half length-ways, scoop out the seeds, wrap in tinfoil, bake on high for 30 - 60mins (depending on the size). Remove from oven, spoon out cooked flesh, mangle with a fork. Done. Pumpkin (butternut) purée ready for your bread. Easy! I've worked out that a 1.5kg butternut, which is a brute of a thing, gives you about 900g of cooked flesh, which is equal to two cans of pumpkin purée. Now, you only need half a can to make one loaf, but what I recommend you do is portion your cooked butternut and then freeze what you don't need for another day of loaf baking. You could also mash in a bit of salted butter, cinnamon and nutmeg and enjoy it with dinner, something that's part of my Christmas menu. Butternut's around all year, but as soon as you put cinnamon and other lovely spices with it, it becomes an autumn or Christmas food. Which, if you know me, is my favourite time of the year. Anything that reminds me of Christmas is a good thing! 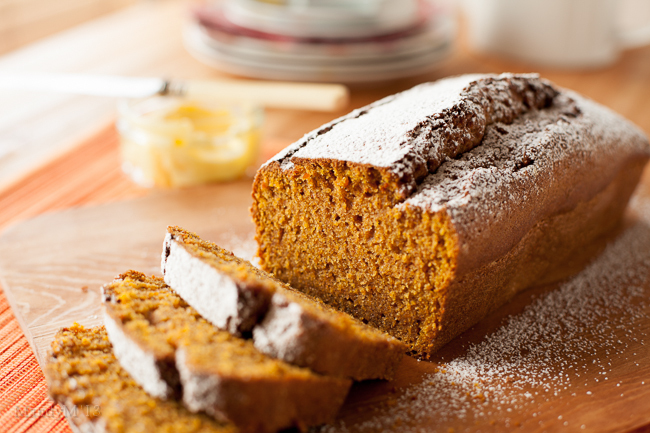 This pumpkin bread is a good start to the season. Flavoured with cinnamon, cloves, ginger, nutmeg, all spice and nutmeg, you can just imagine how tummy warming it is. Once you have the purée at hand, it's as a quick bread recipe should be. Quick. Well, to throw together, anyway, like other loaves it is in the oven for a while, but it's no effort to make. It's super moist and lasts very well for a couple of days when kept in an airtight container, but it probably won't be around for days because there's always another excuse to have another slice. One slathered with salty butter with breakfast, one with your morning tea. Another at lunch, and of course, one with your afternoon chai latte. And of course, you may as well end the day with another slice, it would be rude not to. Because it's fairly easy to throw together, it also makes a lovely hostess or Christmas gift for neighbours and friends, just wrap it up in some clear cellophane wrapping and a big fat red bow, and you're sorted. A delicious gift that won't be re-gifted. So get your butternut roasting and make this bread! And finally, The Great Irish Bake Off Final! Honestly, I was actually feeling nervous when I started watching the episode. I really didn't have any idea who the winner would be, or who I would want to win. Maryanne, Will and Stephen are all great in different ways and I just couldn't even begin to imagine who it would be. So I'll just dive straight into the episode. First up, a Technical Bake. The last our three remaining bakers would ever bake, and being the final, Paul didn't hold back. Their challenge, two and a half hours to bake a range of petit four; vanilla fudge, poppy seed tuiles, fruit tartlettes and salted caramel white chocolate lollipops. Definitely sounds like a Paul challenge! Starting with the vanilla fudge (I hope you meant to say vanilla extract and not essence, Anna) as if these challenges weren't hard enough, it would have been nice if our bakers had been given the correct sized tin for the fudge to set in. As Will said, "We're doing petit fours here, we're not doing petit thins." Exactly. But, they all made do with what they had and MacGyvered the tins to their needs. 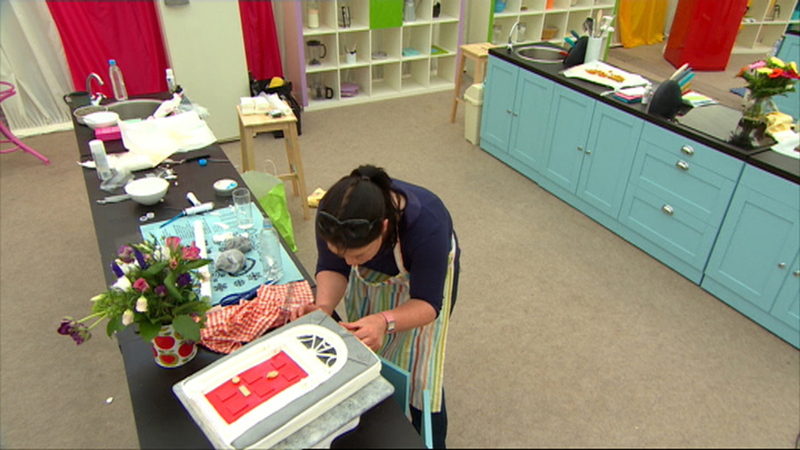 After watching all three contestants having to faff with tiny fiddly details, it's no wonder I don't make petit four, they're a pain to make! I'm so glad that I know where I can buy mini tart shell pre-baked. That's saying a lot from someone like me who enjoys baking from scratch. Paul, you're a lovely guy, but this challenge was just mean! First on the chopping block was Will. Paul was on the attack and pointed out that the fruit tarts were not garnished the exact same way, with strawberries on some and not on others, same with the blue and blackberries. He also commented that his fudge chunks were too large, but to me they looked smaller that the ones himself and Biddy were enjoying by in the beginning of the show! Tut tut! Paul also didn't like that Will hadn't toasted the coconut that went on the outside of the white chocolate lollipops (and dare I point out that there was no coconut in sight on the example plate? Just saying...) He also didn't like the tuiles. Stephen never got his fudge on to the plate, it hadn't set up so was impossible to serve. But Paul really liked the tuiles and thought they were perfect. Stephen's fruit tarts were also not garnished in a uniform way, but he did remember to toast his coconut on the lollipops, although lacking salt in the caramel. Maryanne's fudge was perfect, but she had tuile issues, putting double the amount of flour into the tuile mixture by accident and leaving out the icing sugar. But, the judges loved how uniform all her petit four were and the fruit tarts were garnished the same way on, Paul thought her plate was very pleasing on the eye. Will was put in last place, Stephen in second, and Maryanne walked away winner of the Technical, even with her too floury tuiles. I must say, her petit four were the best looking of the three, but I would have penalised Stephen for not having one of the petit four on the plate at all and given him third. Then it was on to the Show Stopper. The theme was Irish Landscapes or Heritage, a lovely end to the series. The thing that struck me the most was how different each baker approached the theme and how they came up with such different ideas from each other. Maryanne chose to do a Georgian door, something I'm fascinated with myself as I just love all the different colours all lined up down the street. And, Maryanne, a baker after my own heart, went with a carrot cake as the base. I <3 carrot cake! It's my favourite, hands down, and I make mine with roasted pecans. Yum! Will decided to make Hook Lighthouse, something particularly sentimental to him and his girlfriend (fiancé now!) which I thought was a lovely idea. But, what I loved the most was his brilliant and very creative approach to it. The lighthouse would be surrounded by white chocolate waves, done in a very inventive way. I couldn't wait to see it! Stephen's Irish landscape was a gingerbread construction of Dunluce Castle, traditionally glued together with royal icing and sitting on pistachio and mint grass. His was also a sentimental choice as it was a place that his father loved. As the day progressed, it was clear that the weather would not be helping stress levels, it turned unbelievably hot, not good for chocolate, gumpaste and general morale. Although you wouldn't know it from Stephen as he decided to have a break and juggle some eggs (which didn't break!). Because of the crazy high temperature Maryanne resorted to working on her cake inside the fridge, but Paul kindly pointed out that the moisture would make the fondant even stickier. But Will wasn't happy with the heat already in the tent, he was going at his cake with a blowtorch, while Stephen coolly tiled his gingerbread castle with bitesize Shreddies. As Maryanne said, this one would be a tough decision for Biddy and Paul because each creation was so different. She was first up, and I was blown away with her finished cake. She has been incredible with her decorating, and she outdid herself again. Neat, precise, detailed, finessed, it really was a beautiful creation. Paul loved that she had carved into the cake so that the door was recessed and really was 3D, and not just gumpaste stuck onto the top of a flat cake. Both judges thought that there was a bit too much nutmeg, but Paul loved the combined flavour of the sponge and walnut buttercream. An incredible cake, especially considering the heat. Stephen's gingerbread castle really was very impressive. The different buildings were well constructed, although I actually didn't like his choice of using bitesize Shreddies on the roof, as I can't imagine those dry and plain little bites of cereal would be particularly tasty, but Paul and Biddy loved the gingerbread biscuit and the cake that was laid down as the ground. Will's lighthouse looked more like an art piece rather than a cake. He cleverly had painted a balloon with white and blue chocolate, then once the chocolate was set, he popped the balloon (while everyone held their breathe!) and was left with a shell that acted as the waves coming around the sponge lighthouse which was nestled inside. He finished the top off with gold leaf to represent the light, and it really was beautiful. Paul just didn't like that the lighthouse itself was leaning over, he thought it looked as though it had fallen. 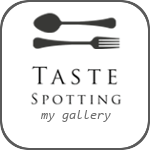 They also enjoyed the taste. At the start of this episode I had no idea who would win, but at the end, I was leaning a certain way, I wondered if the judges were thinking the same. The moment before the winner was announced, you could just feel the tension and nerves. Maryanne, Will and Stephen were joined by the other contestants and their family. What a day! After plenty of nervous looks, long bars of tense music and a knowing smile from Anna, Stephen was announced the winner of the first ever Great Irish Bake Off. What a finish, and already, I can't wait for the next series! As promised, here's another video. This time I met up with Will for a bite to eat and to have a chat about GIBO. Enjoy! 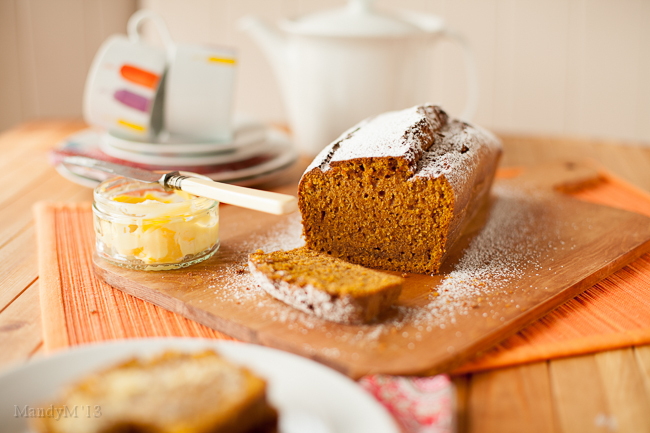 Posted on November 8, 2013 by Mandy Mortimer and tagged GIBO Great Irish Bake Off Spiced Pumpkin Bread Quick Bread Autumn Fall Halloween.